Gifts for the lovely ladies in your life! Striking wooden petal necklaces in beautiful colour combinations. Available in short and long styles. Wooden flowers inspired by the English countryside - create your own unique bouquet with flowers from the range or choose from a selection of different sets. 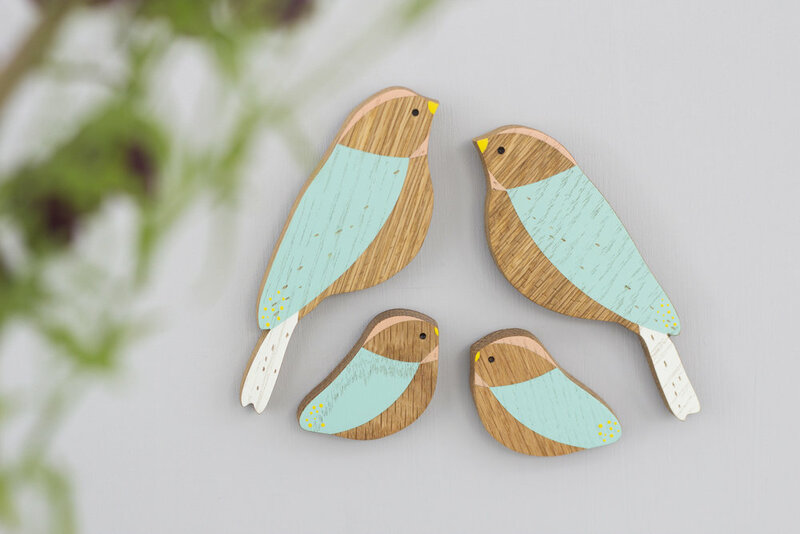 Cute wooden bird brooches make the perfect gift. Delicately hand-painted in London. Pretty wooden earrings inspired by British wildflowers - lightweight and easy to wear. Limited edition decorative wooden houses; wonderful little gifts for ladies that love their homes! Family sets of wooden wall birds - great gifts for Mums, Mums to be, Grandmothers or any lovely lady in your life! Also available individually or as pairs. Wooden petal earrings - a stylish design that compliment the wooden necklaces perfectly.